July 3, 2015. For the first time in our lives, we got to fly business class across the Atlantic, on the way to a conference and a visit with my niece for July 4th. Never did I think I’d get to experience this kind of luxury, but thanks to an overloaded flight, we got bumped up. Just so you know, Matthew has advised me not to post this story, because he thinks it might come across as braggadocious. 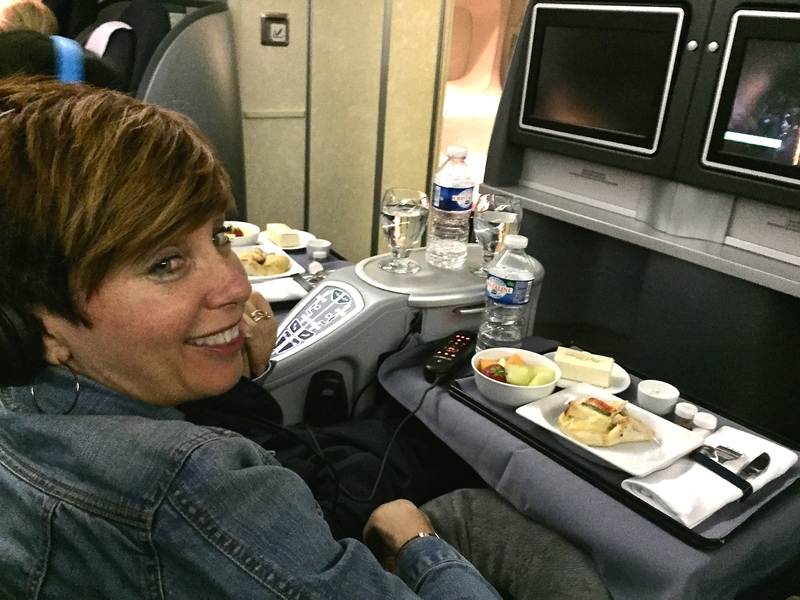 My personal feeling is that some folks might be as fascinated as I was by the amazing privileges available to the wealthy, so in the interest of public education — and because my blog is also intended to help me remember all the little details of my year in Europe — I’m sharing my once-in-a-lifetime flight experience with you. Skip it if you’re offended. Yeah, I’m trying not to freak out that I’m facing backwards. Note that the seat comes with three different remotes. Now mind you, Matthew and I have logged hundreds of thousands of miles on planes in the last several years, and never have we been upgraded to business class. I don’t know why the fates blessed us this time, but as usual with gifts from the gods, it came with a catch. 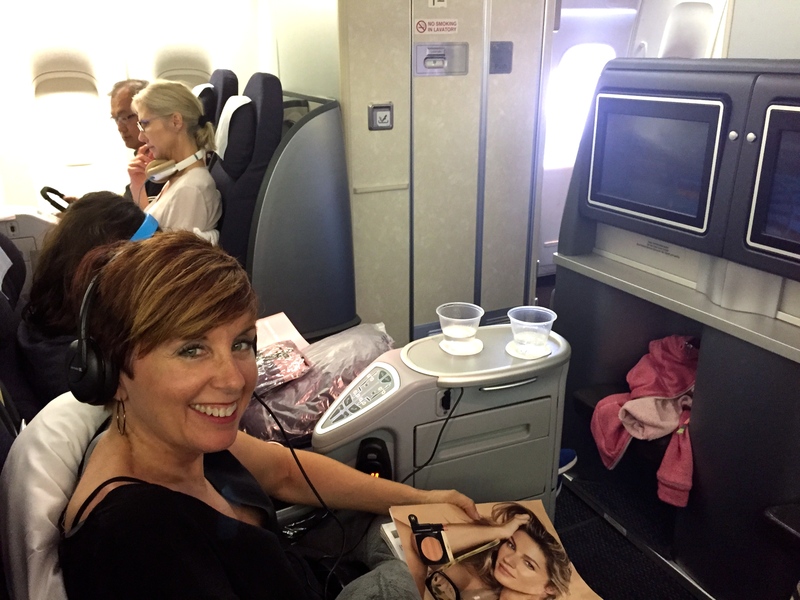 The flight attendant escorted us to our fabulous new seats … that faced backwards. Now this might not bother most of you, but for a motion-sickness-prone person like myself, I immediately had a panic attack. I can’t even ride in the rear-facing bus seats for ten minutes, and the thought of hurtling backwards at 550 mph for nine hours had me reaching for the dramamine. A request to switch back to our old seats won us a “negatory” from the airline attendant. So I swallowed my little orange tab and sat back in my chair, praying I wouldn’t embarrass myself in front of all the fancy passengers by having to use the air-sick bag. Within moments, an attendant showed up at my elbow with a warm, wet towel and an offer of a glass of wine. I thought she was being solicitous of my nerves, but as it turns out, everyone in business class gets the towel treatment — and any alcohol they desire — before the plane even leaves the ground. 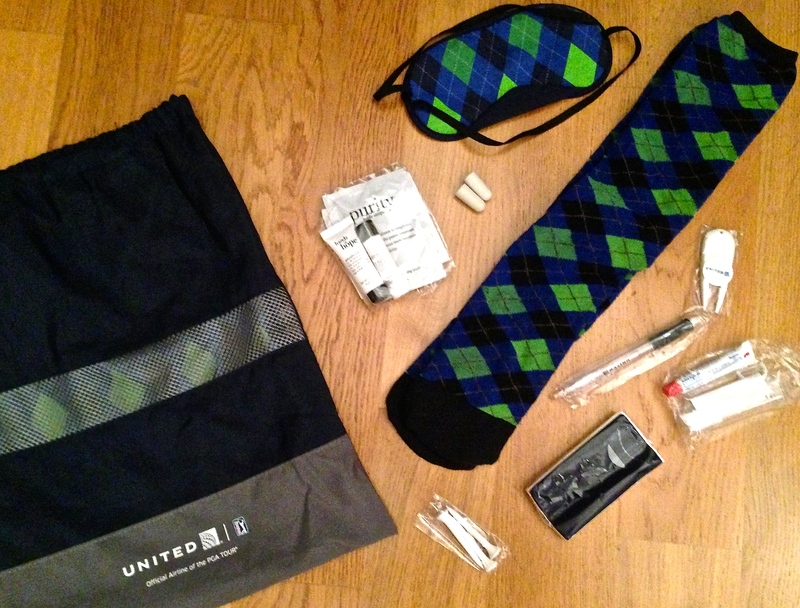 Along with my glass of wine came a sweet little duffle bag filled with goodies like wool socks, a silky eye mask, a toothbrush kit, ear plugs, a bag of Kiehl’s products, and super-cushy earphones. Our handy-dandy business class duffle back came with everything you need for a relaxing flight overseas. As we prepared for take-off, I investigated my plush surroundings. A big-screen monitor (when compared with the mini screens in coach) would allow me to watch TV without my glasses. Now if only I could figure out how to use the complex series of remotes. Sadly, the 12-year-old next to me had to give me a tutorial, and from her considerable knowledge of the many available gadgets, it became clear that business class was not new to her. Apparently she and her entire family of five fly this way all the time — can’t imagine the cost of that one! Eventually, the moment of reckoning came, and we began speeding down the runway. Unlike a regular take-off, where the force presses you back against the seat, flying backwards means you’re thrown forwards. I spent about ten minutes with my face planted in my lap, feeling like the seatbelt was the only thing preventing me from crashing into the bulkhead. Thank god, once we reached cruising speed, the sensation diminished. As long as I kept my movements small, I wasn’t as aware of the thrust. But if I reached out for something located far in front of me, like the TV screen or the footrest, my hand would shoot out like lightning, while retracting it felt a bit like moving through molasses. The menu — in three languages. As my dramamine took effect, I made up my mind to enjoy the moment as much as possible, and set about taking notes. First off, the seat was a marvel in itself. Like the most amazing La-Z-Boy recliner ever, it could adjust in multiple directions, and of course it extended all the way out to meet the footrest, forming a bed just about big enough for me to stretch out fully. Next to me, a cool little cubby held reading materials and a menu. Can you believe it? 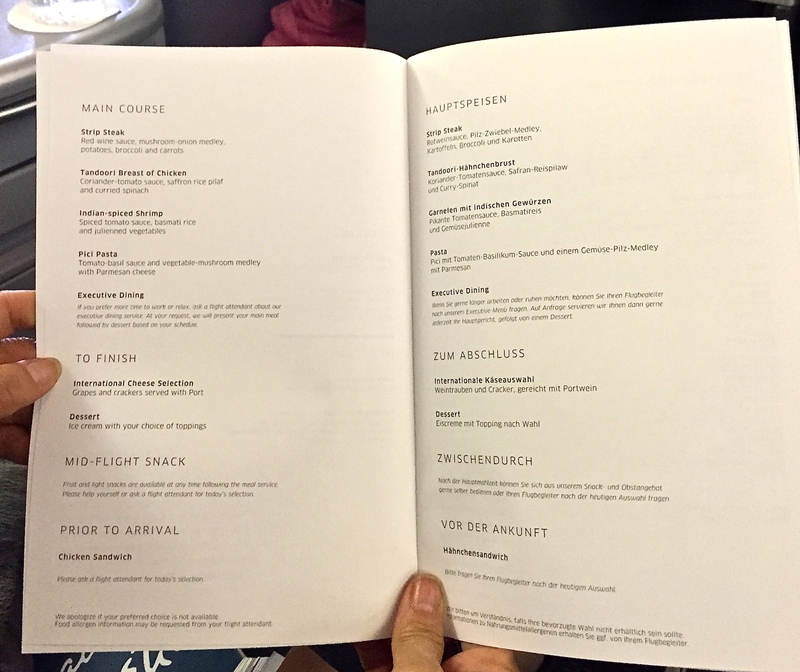 An actual menu featuring a list of options for a four-course meal, plus a wine list. The pre-landing meal — at this point I’m clearly slightly tipsy from all the alcohol. I just couldn’t refuse anything they offered. After all, when will I get another chance to dine in style aboard a plane? My only disappointment? I felt absolutely incapable of taking advantage of the opportunity to lie down for fear I’d suffocate under the load of my overly full stomach. And the food just didn’t stop. About halfway through, flight attendants using little silver tongs distributed warm chocolate cookies from a lovely white basket. And right before we landed, the attendant brought a yummy chicken sandwich (not the greasy, mushy kind served in coach), plus fruit salad and chocolates. To top it all off, I never once had to wait in line for the palatial bathroom, and the flight attendants were always relaxed and friendly, not harried and short tempered from the strain of dealing with a mob of 200 economy passengers. So on the whole, I’d have to give United Airlines BusinessFirst a big thumb’s up for their transatlantic service, and I’ll start saving now for my 80th-birthday gift to myself of a first-class flight. I figure it’ll take me that long to accumulate the necessary bankroll, although I can’t image what more could be offered in first class when business class is so amazing. But I’d like to find out…. Congrats! Marlo & I hope to experience that level of luxury someday. We’ll have to switch from Southwest. Yep — we’ve flown Southwest for years, and all we’ve ever gotten with our many miles is an extra bag of peanuts. But I have to say, the irreverent humor of Southwest airline attendants is its own reward — a huge improvement over the “I’m-better-than-you-because-I’m-a-waitress-in-the-sky” attitude evidenced by most other stuffy airline employees. You crack me up woman! I’ve become such a flying snob that I have started to find fault in tiny details, ‘gee, they only had brandy for post meal.’ or ‘dang, their white wine sucked’. Or ‘poo. Ive seen all these movies.’ It’s fun though. the best part of business class is the access to the airport lounges where all the cool stuff is. Best lounge I’ve been to, Turkish Air in Istanbul. It’s like a sultan’s harem over-loaded with gluttons and unlimited top shelf liquor! Glad you got to appreaciate how the other half lives. Yeah – I really wanna fly first class sometime and see exactly what goes on in the upper level of the aircraft. I just want a chance to climb those spiral stairs and see the supposed lounge and bar that the really rich get to experience. My sister-in-law’s dad worked for Boeing and she got to fly first-class all the time — the stories she tells are awesome!